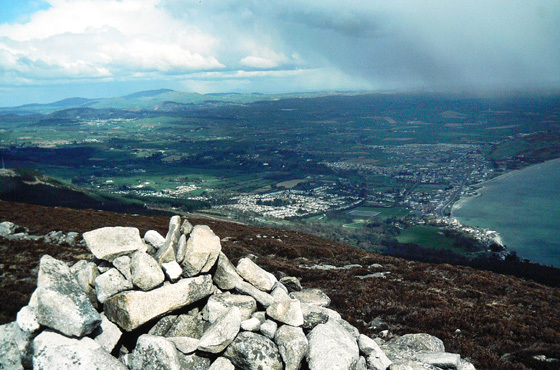 Millstone Mountain is the 690th highest place in Ireland. 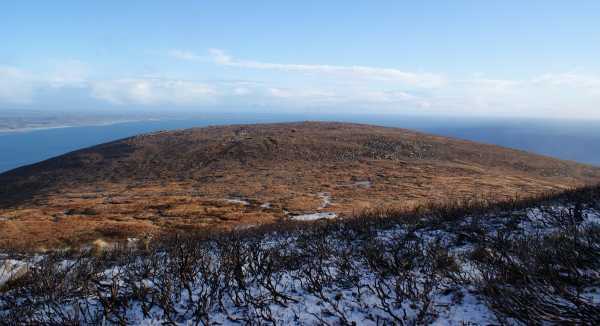 Millstone Mountain is the most easterly summit in the Mourne Mountains area. Start out from the supermarket sized carpark at Donard Park and follow the tried and tested route up along the Glen river. The path follows one bank of the river then the other, as bridges span deep incisions in the tough Mourne rock. At the third bridge (365297 A) leave the crowds who continue with the river and take the forest track heading SE. The track drops slightly before rising up out of the pine and holly trees to reach the working granite quarry below Thomas's Mtn. A fridge/freezer sized block was hewn and strapped ready for moving - unlike the small stream usually tumbling down the back of the quarry wall which was all but frozen due to the recent cold spell.This is a magnificent viewpoint down over Newcastle and the sweeping sands of Dundrum Bay. An amazing place to work i would think. Some motorbikes pulled into the quarry just after i had left obviously using the network of fairly good forest tracks. Continue past the quarry to a gate/stile and take a rough track immediately on the right, climbing above the quarry to the small stream. This was frozen into large chunks of ice as followed on the left side of the little valley it has carved out for itself. All other water on the hillside was similarly frozen and care was needed to avoid slipping. Recent fire has removed all but the bare arms of the heather on a large part of the hillside, aiding walking if nothing else. The cairn on top was reached in an hour. The views are extensive to the N and E - across the little harbour far below, Dundrum Bay, Stranford Lough, Belfast Hills, Irish sea til Isle of Man and a snow capped Slieve Croob. There was surprisingly no snow here (with the Sperrins having a covering from top to bottom) though a quick glance to the higher slopes of Donard fixed that. A very strong wind discouraged dawdling and everthing else! Picture from csd : The view to the north. Picture: The view to the north.